As our August is Ear Piercing Month celebration comes to an end, we want to share some information about different types of piercing earrings and how to choose the ones that are right for you. To start, we need to explain what we mean when we say, “piercing earrings”. Earrings are jewelry you wear on your ears. Piercing earrings – sometimes referred to as “starter earrings” – are pre-sterilized and specially crafted earrings with a sharp tip to create the piercing hole. These are the earrings you will wear for the 6 (earlobe) to 12 (cartilage) weeks it takes for your piercing to heal. Piercing earrings come in a range of choices so it’s good to know what your options are before choosing an ear piercing location. Depending on the piercing system used, earring choices can range from plastic and plastic coated metals to premium fine jewelry quality earrings that you will be able to wear long after your piercing has healed. All Inverness piercing earrings are made of premium metals with fine jewelry crafting. We embellish our styles with everything from diamonds, cubic zirconia and fine crystals to give you a variety of style and color choices. 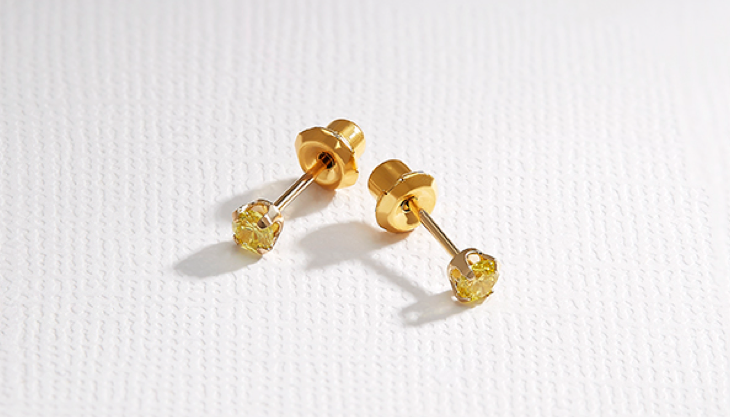 14KT gold piercing earrings are valued for their beauty and durability. Since pure gold is soft and malleable, it is combined with other metals such as copper and nickel to make it stronger and more durable. Yellow gold is popular for its timeless color. The contrast of yellow gold with diamonds and other delicately colored gemstones creates a brilliant and vivid look. White gold offers a bright and lustrous silver color that is highly reflective and not subject to tarnish. With proper care, 14KT yellow and white gold styles will last a lifetime. TIP: after your piercing has healed and it’s time to change your earrings, you can file down the tip of your piercing earring to make wearing it more comfortable. Piercing earrings are also widely available in 24KT Gold Plate, Medical Grade Stainless Steel, and Medical Grade Titanium. When choosing one of these options, be sure that the metals used are the highest quality and adhere to the most stringent global standards for nickel release requirements (European Union Nickel Release Directive No. 1907/2006, REACH Annex XVII). Titanium piercing earrings are ideal for people with known nickel allergies since they are 100% nickel free. We hope this information helps you to get prepared for your next ear piercing. Are you ready now? To find an Inverness Ear Piercing location near you, visit our store locator today!